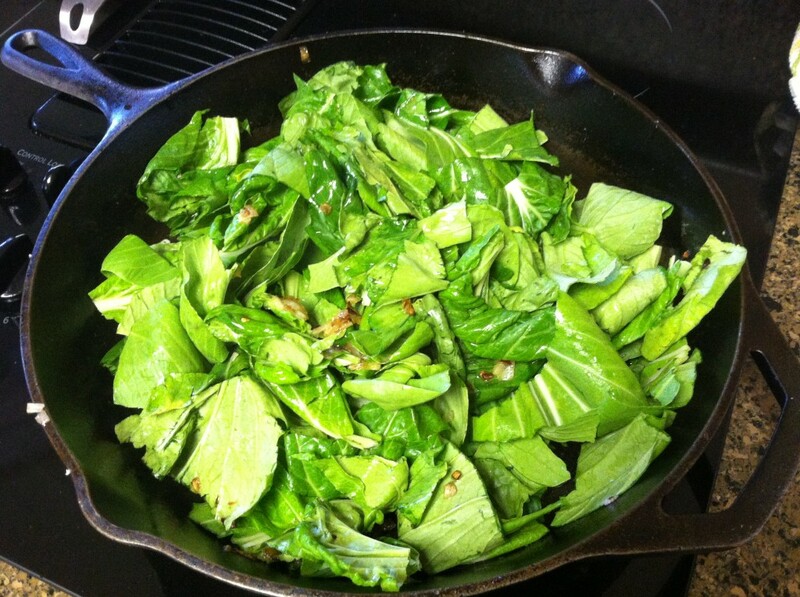 Raise your hand if you can tell me what those greens are in the picture. Anyone? If you had asked me that a year ago I would have had absolutely no idea. I would have said some kind of green, which is painfully obvious, but I would have no idea which green it was. And if you had told me it was bok choy (on the left) and tat soi (on the right), I would have laughed….such odd names, don’t you think? But since I joined Urban Acres, a local produce co-op, I’ve had the opportunity to learn about so many new vegetables. I have no control over what produce shows up in my bin every two weeks, and have learned to be brave and figure out how to cook new vegetables. Some have been really good (like the recipe below), and others…..not so much. But that’s how cooking works: sometimes (hopefully most of the time) you win, and sometimes you lose get the opportunity to try again. So a few weeks ago I had bok choy in my bin, along with some tat soi. 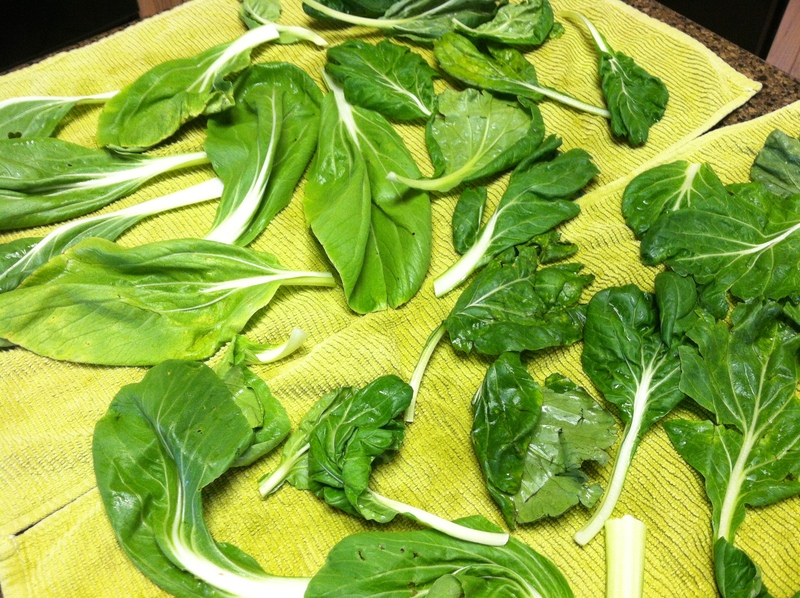 Since they are greens, and can pretty much be prepared like any other green such as spinach or chard. 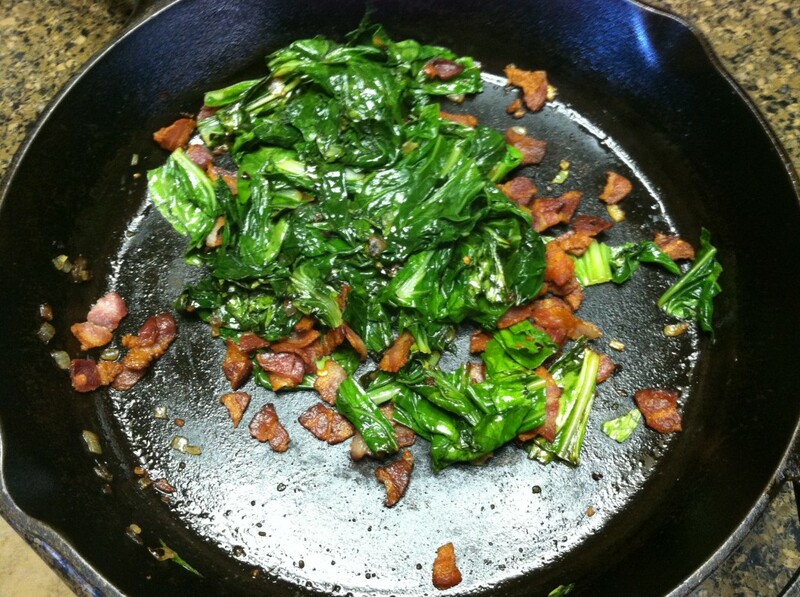 But as luck would have it, I found a recipe over at Musings of a Housewife that called for both greens……as well as bacon. Yum! Looks like enough for my family, right? The picture really doesn’t do it justice…..it was just about enough for one, maybe two small servings, which was sad because it was yummy. So next time you get a new vegetable in your produce bin, see a recipe listing an unfamiliar ingredient, or just see something new at the grocery store, don’t be a afraid. Google the ingredient and find yourself a new recipe. You may just end up a winner.